Pints Alehouse is a boon for north-side brew lovers. 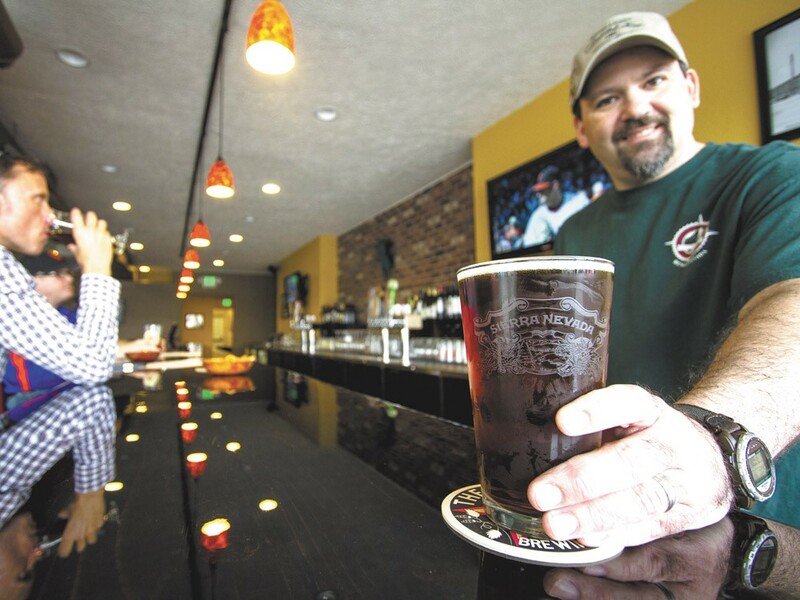 Pints Alehouse owner Derek Quist with a cold brew. Remember when you were a kid and a crisp, unopened bag of jellybeans promised to smack your taste buds with ambrosial surprise? Well, kids, here’s your new bag of jellybeans. Walk in to Pints Alehouse on Newport Highway in north Spokane and you will be greeted with the scent of hops and the sight of 18 shiny taps. Pints features gluten-free choices among its ales, porters, IPAs, ambers and seasonals. You won’t find any food on the menu. How, pray tell, can this end well for a beer lover? Fortunately, owners Derek and Patricia Quist assist me in narrowing down my choices. After spending six years visiting more than 100 breweries from Spain to Mexico to the United States, they provide well-informed suggestions and knowledgeable guidance to customers. I decide on the five-beer sampler tray ($9). The four-beer tray ($7.50) seemed too weak, and the six-beer ($10.50) mildly excessive. Plus, I already had my eye on the Dogfish Head Sah’tea ($6.50), a ninth-century Finnish spiced ale that isn’t available for sampling. Derek suggests I start with the Finnish ale. He enjoys explaining how the beer is brewed using heated river stones, an ancient and indirect heating method that is currently reproduced by the Dogfish Head Brewery in Milton, Delaware. Light gold in color, with a fizzy texture and faint clove finish, the S’ah’tea was a good start. Next was the Leavenworth Biers Friesian Pilsener — hoppy, with a streak of bright citrus flavor and a bitter finish. The Dogzilla Black IPA was a bit too bitter for me, but Quist described it as “the best of both worlds” with its combination of roasty flavor and hoppy bite. The North Coast Old Rasputin Russian Imperial Stout, a nitro-blended beer, is a silky, creamy, malty beer that bought much joy to my world. Derek explains that he and his wife were tired of driving to the South Hill for micro-brews, so last month they opened Pints on the north side, an area in need of some craft brews. The Quists follow the on-tap philosophy of “when it blows, it goes,” so expect to see new and exciting brews introduced to the north side with regularity.